The innovation of technology has been a continuity thoughout the world's history, except it has now became a day to day occurence. Due to globalization information on the latest technology can be spread across the world, leading to more new ideas to develope. The internet is now the "middle man" in the world connecting the ideas and information leading to the growth in technology. In many ways the spread of technology is good, their are cases where information being obtainable by any caused harm to humanity. Nuclear weapons had become a symbol of military strength in the modern world, which leads some nations to believe that if they wish to feel safe they need to aquire them. The first nuclear weapon created was in 1945, since that date there has been a "boom" in production rate. The start to this strive for nuclear weapons was the Cold War, the USSR was intimidated by the United States recently aquired nuclear weapon that they needed to get one as well. This stared the chain reaction in other countries to get nuclear weapons of their own. No country wished to feel unprotected, some went on to get nuclear weapons of their own. South Africa was the only one that gained a nuke, but later on dissmantled it for the sake of world peace. Ronald Reagan was a strong supported in dissmantaling most of the nuclear arsenal not only in the United States, but also in the world. This was all for a better, safer, and peaceful world and many other government believe in this idea as well. 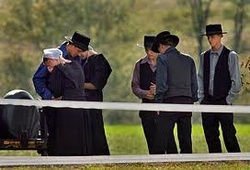 The Amish are people who choose to distance themselves from any sort of technology that they deem immoral or unethical. This being an extreme example of technological withdraw countries with religious, or poltical reasons choose not to allow certain technology to be alowed into their country. Iran has a country owned internet, and China has a strict policy on what is allowed into their search engines. · Friedman, Thomas L. "The Dell Theory of Conflict Prevention". Also see, Catarina Kinnvall & Kristina Jonsson (edited). (2002). Globalization & Democratization in Asia: The Construction of Identity.